Decompression machines are specialized, motorized traction devices that allow your healthcare provider to position your spine and target an area for decompression therapy. They work by gently stretching your spine. HOW IS SPINAL DECOMPRESSION THERAPY DONE? You are fully clothed during spinal decompression therapy. Your healthcare provider fits you with two harnesses and you lie down on the computer-controlled table. The computer settings are then customized to your specific condition. Spinal decompression therapy is not recommended for pregnant women, patients who have severe osteoporosis, severe obesity or severe nerve damage. It is also not recommended if you have had spinal surgery with instrumentation (screws, metal plates or cages). For most patients, spinal decompression is a safe and effective therapy. Your healthcare provider can help you decide if spinal decompression is right for you and your specific condition. No. In almost all cases, the treatments are completely painless and most people even notice a reduction of pain during their sessions. In fact, some patients even fall asleep. Individual sessions typically last 20-30 minutes. To achieve long term health benefits, you will require several sessions. Your healthcare provider can develop a treatment plan that meets your goals based on your specific condition. 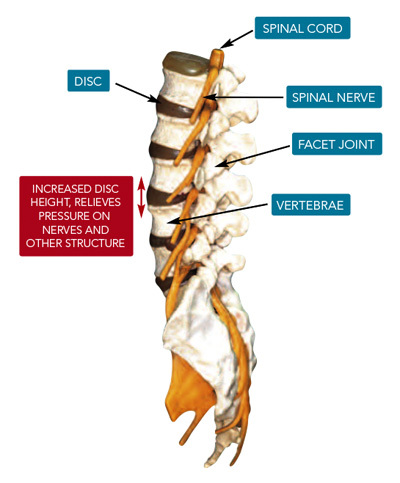 HOW IS SPINAL DECOMPRESSION DIFFERENT THAN TRACTION? Regular traction stretches your spine and muscles simultaneously. If you only stretch the spine, your body naturally “braces” for the next stretch reducing the ability for the treatment to be effective. This “overall stretching” commonly used in traction can also trigger painful muscle spasms. 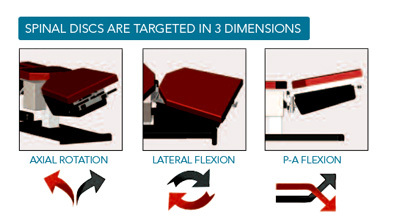 Decompression therapy is different than conventional spinal traction (3,4) , it alternates between stretching and relaxation. The relaxation stages, trick your body into staying relaxed and therefore maximizes the load and the effectiveness of the treatment. WILL I STILL NEED OTHER THERAPY? 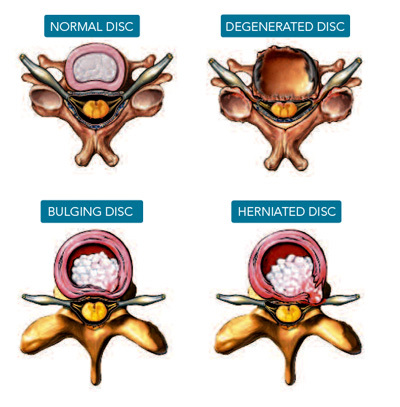 Spinal Decompression Therapy is generally only one part your overall treatment plan. There are other therapies your healthcare provider may recommend to help speed up your healing process. These often include: ice or heat therapy, chiropractic adjustments and/or active rehabilitation to strengthen spinal muscles.